Algarve Pro Racing Team has won the 2017-18 Asian Le Mans Series Gentleman’s Trophy with Ate Dirk de Jong, Dean Koutsoumidis and John Graham. The Albufeira, Portugal-based outfit’s all-Bronze driver line-up overcame a steep learning curve to secure the coveted trophy, despite retiring from the season-ending 4 Hours of Sepang in Malaysia (Sunday 4 February). 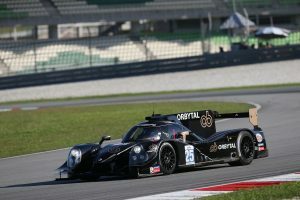 Koutsoumidis took the start of the fourth and final round of the 2017-18 AsianLMS, successfully negotiating the opening laps while carefully picking his way through the slower GT and LMP3 runners, only to lose third gear and grind to a halt at Turn 14 after approximately 30 minutes of racing. A valiant attempt by the Australian to recover the ailing Ligier to the waiting Algarve Pro Racing mechanics proved futile, and outside assistance from the Malaysian marshals was required to move the car out of harm’s way. Nevertheless, Koutsoumidis and his Algarve Pro Racing teammates, de Jong and Graham, leave Sepang International Circuit as winners, who will be presented with the Gentleman’s Trophy at the official AsianLMS Awards Ceremony on Sunday (4 February) evening.